I hope the winter months are going well for you, and like us, you are looking ahead to summer and thinking about Wachusett. While things are quiet on Lake Hortonia, we have been planning and recruiting for the 2019 camp season, which is just a few months ahead. If you haven't signed up yet, please remember that March 1st is the Early Bird deadline for a trip to the Great Escape theme park and 10% off of tuition. Our recruiting team has been working hard to market camp to new and current families for 2019. We have attended camp fairs in New England and Maryland and were pleased to be joined by some dedicated campers and staff to help promote Wachusett to prospective families. We would also really appreciate any help you could provide to spread the word about camp to people you may know with boys who would enjoy a summer at Wachusett. The following link: https://www.flipsnack.com/thumpercralle/camp-wachusett.html will take you to an electronic version of our brochure. Please take a look at it and feel free to forward it on to people who you think might be interested in our camp. Hopefully, anyone who looks at our brochure will be inspired to check out our website http://campwachusett.com for further information. A couple of enhancements for next summer include: new basketball backboards, and a special three day trip during the week of July 14th to the old camp property in Holderness, NH, limited to ten boys in 7th grade or older, to hike and enjoy the Squam Lakes region. A glance at our brochure will show a daily schedule, which includes the return of "Store." So far, we have an enthusiastic contingency of staff returning for next summer who are looking forward to providing six weeks of entertaining, educational and fulfilling land and water activities including hiking, canoeing and special trips to the surrounding areas. Matt Dandola will be sharing his expertise in staff development during preseason and will oversee the leadership programs for CITs and Junior Counselors. We are excited to announce the return of senior staff members: Ollie Martin, George Dobud, Peter Krogh, Nick (Chief) Avery and Matt Oxley. Also, Una will be returning as our cook to provide delicious camp meals. If you have any questions, suggestions,or would like any further information please feel free to e-mail me anytime. We are looking forward to a great summer! "The Camp Where Friendships Grow"
Please visit our website:campwachusett.com for more details. Don't forget to sign up before March 1st! 10% off tuition for the 2019 Camp Wachusett Season. A trip to Six Flags Great Escape and Splashwater Kingdom in Lake George, NY. Greetings. I hope everyone had a great holiday season. We are getting off to a great start with the new year. The Early Bird discount will be extended to March 1 with 10% off of tuition for those returning to Wachusett and 15% off for those new to Wachusett. We will be attending four camp recruiting events in January. Come join us if we are near your neck of the woods: January 12 we will be in Mt Kisco, NY attending the Westchester Family Camp Fair from 12 - 3:00 PM at the NY Grand Prix on Bedford Avenue; January 13 we will be in Mamaroneck, NY attending a second Westchester Family Camp Fair from 12 - 3:00 PM at the Mamaroneck Beach and Yacht Club on Barry Avenue. On January 23 we will be in Greenwich, CT attending the “Greenwich Summer Fare,” held at the Greenwich High School from 6 - 8:00 PM; and finally on January 27th we will be at Montgomery County Camp & Summer Fun Expo in Rockville, Maryland at the Hilton on Rockville Pike from 10 - 4:00PM. We are planning other recruiting opportunities for February and March. This year we are trying a new approach to our brochure. We understand that parents are our customers, but also we know that their boys have a major say in how they want to spend their valuable summer vacation time. We are dedicated to considering prospective campers just as much a customer as their parents while looking into summer programs. 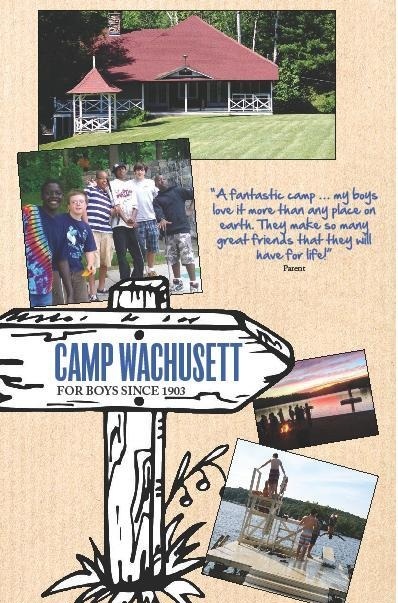 Our 2019 brochure is being marketed to the camper customer in hopes it will pique their interest to ask their parents to find out more about Camp Wachusett and to visit the website for more detailed information. Pictured below is the cover of our 2019 Camp Brochure. I will be mailling out copies to the Wachusett community over the next few weeks. If you do not receive one or are not currently on our mailing list please contact me and I’d be glad to put a copy or more in the mail to you to read and pass on to any prospects. Cover of 2019 Camp Brochure. Greetings from Camp Wachusett! Please join us as we celebrate the holiday season with a 15% off Early Bird sign up between now and January 1st. 15% off tuition for the 2019 Camp Wachusett Season. Don't forget to sign up before January 1st! We have exciting news to report! Click on Picture Below! New additions to the fleet and sailing program! Exciting Updates to our sailing program!